Eskişehir ([esˈciʃehiɾ]; Turkish: eski "old", şehir "city", in Greek: Dorylaeon, Δορύλαιον) is a city in northwestern Turkey and the capital of the Eskişehir Province. The urban population of the city is 717,135 with a metropolitan population of 826,135. The city is located on the banks of the Porsuk River, 792 m above sea level, where it overlooks the fertile Phrygian Valley. In the nearby hills one can find hot springs. The city is 233 km (145 mi) to the west of Ankara, 330 km (205 mi) to the southeast of Istanbul and 78 km (48 mi) to the northeast of Kütahya. Known as a university town, both Eskişehir Osmangazi University and Anadolu University (which has one of the largest student enrollments in the world) are based in Eskişehir. The province covers an area of 2,678 km2 (1,034 sq mi). The name Eskişehir literally means Old City in Turkish; indeed, the city was founded by the Phrygians in at least 1000 BC, although it has been estimated to be older than 4000 years old. Many Phrygian artifacts and sculptures can still be found in the city's archeological museum. There is also a museum of meerschaum stone, whose production remains still notable, used to make high quality meerschaum pipes. In the fourth century AD the city moved about ten km northeast, from Karacahisar to Şehirhöyük. Many ancient geographers described the city as one of the most beautiful in Anatolia. As with many towns in Anatolia, Christianity arrived after Constantine the Great made it the official religion of the Roman Empire. Beginning in the 4th century, records exist of bishops holding office in Eskişehir. The city was known as Dorylaeum (Δορύλαιον in Greek) in that period. One of these bishops, Eusebius, was heavily involved in shaping the evolving dogma of the church. Traditionally dependent on flour milling and brickyards, the city expanded with the building of railway workshops in 1894 for work on the Berlin-Baghdad Railway. As of 1920, Eskişehir was one of the major locations for meerschaum mining. At that time, most of the mining sites were owned by the state. Devrim, the first Turkish automobile, was produced in 1961 at the TÜLOMSAŞ factory in Eskişehir. Devrim never put into mass production and stayed a concept study and can be viewed in TÜLOMSAŞ factory Eskişehir. In addition to production, first Turkish steam powered locomotive called Karakurt was produced at the TÜLOMSAŞ in 1961. Eskişehir was also the site of Turkey's first aviation industry (Aeronautical Supply Maintenance Centre) and its air base was the command center of Turkey's first Tactical Air Force headquarters on NATO's southern flank during the Cold War. Eskişehir produces trucks, home appliances, railway locomotives, fighter aircraft engines, agricultural equipment, textiles, brick, cement, chemicals, processed meerschaum and refined sugar. Eti, one of Turkey's largest food brands (mostly producing biscuit, chocolate and candy varieties) is based in Eskişehir. Arçelik, a major Turkish home appliances and consumer electronics manufacturer, has one of its production plants in Eskişehir. Eskişehir was the first stage of High-speed rail in Turkey from Ankara. This service improved the travel and commerce between Eskişehir and Ankara, thanks to reduced journey time. The city is served by the Anadolu Airport. There are two universities in Eskişehir. These are the Anadolu University and Eskişehir Osmangazi University. The current Metropolitan Mayor of Eskişehir, Prof. Dr. Yılmaz Büyükerşen, was formerly the rector of the Anadolu University. The city has a significant population of Turkic Crimean Tatars. It also attracted ethnic Turks emigrating from Balkan countries such as Bulgaria, Romania, Bosnia, and the Sandžak region of Serbia, who contributed to the development of the city's metalworking industries. Eskişehir also hosted the inaugural Turkvision Song Contest in 2013, which aims to highlight music and artists from various regions of Turkey. The city is also home to the Dünya Müzeleri Müzesi or Museum of World Museums. Most of modern-day Eskişehir was rebuilt after the Turkish War of Independence (1919-1922), but a number of historic buildings remain, such as the Kurşunlu Mosque. The archaeological site of the ancient Phrygian city of Dorylaeum is close to Eskişehir. The city is noted for its natural hot sulphur springs. 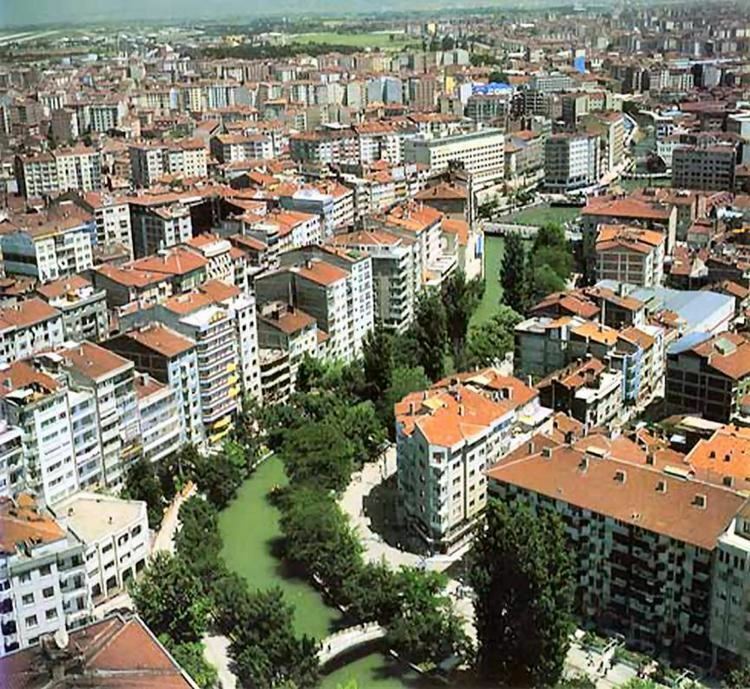 Eskişehir has a humid continental climate with a warm summer subtype (Dsb) under the Köppen climate classification, with cold, snowy winters and warm, dry summers. Due to the low annual precipitation, the climate is near the borderline of a cold semi-arid climate (BSk). Rainfall occurs mostly during the spring and autumn. Due to Eskişehir's high altitude and its dry summers, nightly temperatures in the summer months are cool. Precipitation levels are low, but precipitation can be observed throughout the year.